If she wants to win, Hillary needs to inhale. 22 years after Bill Clinton famously explained away his marijuana use at Oxford by saying "I didn't inhale", Quinnipiac College released a poll yesterday showing that Democrats in the home state he adopted with Hillary favor legalizing small amounts of recreational pot by an overwhelming 65%-31% margin. The margin among New York voters aged 18 to 29? 83% to 14%. With some already wondering aloud if the 66-year old former First Lady is too old to mount a presidential campaign in 2016, the glass ceiling crasher's frontrunner status could evaporate quickly if younger voters find her on the wrong side of a clear generational divide on a high-profile issue. The Clintons saw that movie in 2008 when young voters favored hip Barack Obama (and his well documented pot smoking) over Hillary by 20 percentage points, delivering him both the Democratic Party's nomination and the presidency. 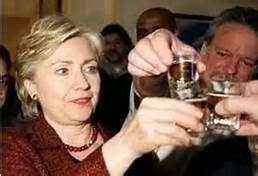 Hillary's high profile hoisting of a shot of whiskey at Bronko's Restaurant and Lounge in Crown Point, Indiana snagged her a one point win in that state's primary but she lost voters there under 40 by 19 points. The Clintons don't make the same mistake twice. Obama was never as much of the edgy cultural leader as his supporters dreamed him to be- witness his painful "evolution" on gay marriage-- but on legal weed the President has become positively nonchalant. He told the New Yorker's David Remnick last month that smoking pot was a vice no different than cigarettes or alcohol. The Democratic Party's leader clearly doesn't think law enforcement should be wasting its time policing adults getting high; his administration just permitted banks to maintain accounts for marijuana dispensaries. So any Democrat looking to generate buzz with the 14% of Democratic voters that the Pew Poll says are under 30 can stand out from the crowd by endorsing legalized marijuana, now. It's a particularly appealing tactic for Hillary, who can make it clear she's not running for grandmother-in-chief with one decisive policy stance. But the marijuana debate is not just a generational rift; it has a strong racial dimensions as well. According to the FBI, blacks are three to four times more likely to be arrested for marijuana possession than whites, despite toking at the same rate. The racial disparity in the enforcement of marijuana laws is serious and inescapable; in fact, it is only a matter of time before the courts could find it a discriminatory violation of the Constitution's Equal Protection Clause. The leading cause of disruption in the black community today is a prison system that holds too many African-American men for too long. Leaders increasingly discuss how the community's progress is stunted because of the more limited employment opportunities for men with arrest records for possession of a small amount of weed. If Hillary doesn't back legalization, she will nonetheless need to squarely address the impact of current drug policy on the black community and offer alternatives of her own. But modest, federal criminal justice reforms will not break through the noise from the legalization movement or meaningfully reduce the state prison incarceration rate for those arrested. The Clintons have worked tirelessly since 2008 to repair strained relationships with some black leaders from their epic battle with the country's first black president. Reopening the wound would be politically fatal to the Clinton campaign. Blacks are 19% of the Democratic primary electorate and much more likely than whites to favor legalizing marijuana, according to a recent NBC/Wall Street Journal poll. A majority of Latinos support legalization too, even though a 2013 Pew study said they are less likely than either whites or blacks to have tried the drug. Of course, the winner of the Democratic Primary still needs to pass through November on the way to The White House. A CNN poll found only 36% of Republicans support legalization. But 59% of politically independent swing voters nationwide back legal weed, suggesting it won't be a major issue for a Democrat in the general election. And voters of all parties can quickly become keen to the tax revenue that would be generated by legal pot. So far, Hillary has shown little interest in puffing her way to the presidency and neither have her rivals. Maryland Governor Martin O'Malley, another potential candidate, was dubbed "buzzkill in chief"by the Huffington Post last month for calling marijuana a gateway that leads to the abuse of other drugs. 56% of New York Democrats polled disagree with him, including 68% of all voters under 29. But as Hillary hits the speaking circuit, lines up fundraisers and ponders her presidential pursuits, she should also turn on some music, pack a bowl and post the picture to Instagram. You can't make history if you are on the wrong side of it.